Demodectic Mange, also known as "demodex" is a parasitic skin disease caused by microscopic mites. All dogs have a few of these mites on their skin. However, when dogs have a compromised or immature immune system, the mites can take over and increase more rapidly. Demodectic mange is most commonly found in young pups under two years of age, but adult dogs (especially those that have been through physical or emotional stress) can develop it too. 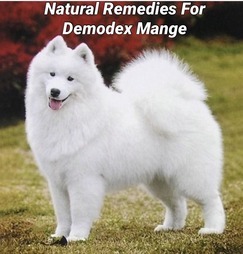 Demodectic mange can be itchy but characteristically causes patches of hair loss first starting on the head and then in more aggressive cases, throughout the body. Treatment for mange can involve topical medication, shampoos, dips, oral medication and antibiotics in the case of secondary infections. While the mange may clear up and respond to the treatment, pet owners should be proactive about taking steps to support their pet's immune system as the pet may continue to have flareups or other immune-related health conditions long-term. Holistic care is a crucial part of treating Demodectic mange for the long term health of your pet. Feeding a hypoallegenic, anti-inflammatory diet along with a few supplements can help the pet get back on track and reduce the likelihood of a flare up. Amazing Omegas - Absolutely the best fish oil available for pets. Packed in glass bottles to prevent leakage of toxins from plastic into the oil. Purified for heavy metals and toxins. Manufactured gently so that oils are in bioavailable form, increasing absorption. Amazing Omegas gives cats and dogs a beautiful lustrous coat and helps promote hair regrowth. Power Probiotic - Power Probiotic is the best probiotic for pets! Backed by scientific research, this powerful, multi-strain formula promotes the growth of good, friendly bacteria which boosts your pet's immune system. Because it fights infection and yeast, Power Probiotic is essential if your pet has taken antibiotics. Pure and natural, Power Probiotic does not contain any fillers. It is especially helpful for pets with digestive problems, urinary tract infections, autoimmune disease, skin problems, yeast and allergies. Many pets love the taste of the Power Probiotic! Immune Harmony - Immune Harmony contains a unique patented sterol formula for immune support, a powerful antioxidant formula which protects the body from free radical damage and an essential fatty acid complex to help with bioavailability of the nutrients. Immune Harmony helps to rebalance the immune system and can be used with prednisone and/or antibiotics. This formula is helpful for autoimmune conditions and pets with long-term immune system issues such as demodectic mange and cancer. NotaSAN and QuentaSAN - Two powerful immune support formulas that boost immunity, fight infection and support healthy skin. Use together for best results. Silver Immune - The Germinator! This easy-to-use gentle formula is a powerful infection fighter and can be used orally and topically. Just watch as this miracle formula helps to heal the skin. Feeding a raw food diet can also be beneficial as the fresh nutrients provide enzymes, antioxidants and highly digestible food that support a healthy immune system.